Since this year marks 7 years in the classroom it’s a good time to talk about teacher burn out and self-care. Teaching is an exhausting job. It never gets easier in terms of the energy and emotion that go into teaching and caring for a group of young people year after year. Even with the summer break, it’s easy for teachers to feel stressed and emotionally drained as the school year goes on. Our veteran teacher leader of the Missouri Teachers Academy knows this feeling all too well. That’s why she bought us all a copy of the book “The Energy Bus” as a nice easy read full of great reminders on how to take care of yourself to live a fuller life and avoid burnout in any profession. 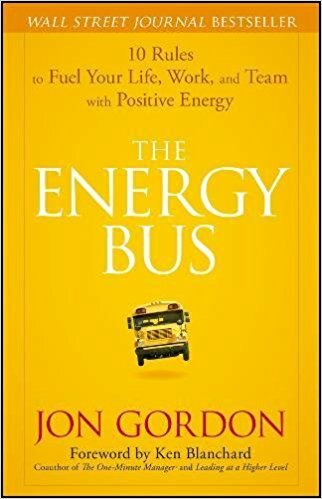 The analogy in the book is a simple but powerful one: Only you are the driver of your “bus” and it’s your job to steer the bus in the right direction and have fun while doing it. This means avoiding the “energy vampires” and taking time to fuel yourself properly to continue the journey. This is MUCH easier said than done, which is why the book helps you to reflect on how well you’re accomplishing these goals and maybe think about making small changes to become a better driver. I know for me this is what it did. I had a few difficult students and even some depressing colleagues who kept weighing me down and it was poisoning my passion and excitement for my job. I wasn’t even noticing it but my students could tell if I was having a bad day or if I just didn’t put the same enthusiasm into my lessons. After reading the book I proactively managed difficult students and if I couldn’t change their attitude I made sure it didn’t affect mine. I also avoided conversations with disgruntled colleagues and sought out my own personal growth to inspire new lesson ideas. A big part of my fuel, I realized, was all of the amazing people at The Missouri Teacher Academy and our teacher leader who helped us grow every month with her energy and passion. She understood how isolating and difficult teaching can be sometimes and she was right. All of us teachers must ensure that we look after our well-being and never lose sight of our energy bus. I highly recommend the book as a quick read and great reminder–probably every year when it’s the mid-year slump hits and we teachers need a reminder of why we love what we do and how important our positivity and energy is to our students.